JVI Electromechanical Vibratory Pan Feeders are heavy-duty, time-tested performers in bulk material handling. Ideal for many applications, including: bin/hopper discharge, feeding wet or sticky material, spreading, truck dump stations, railcar unloading stations, and crusher feeding – just to name a few. 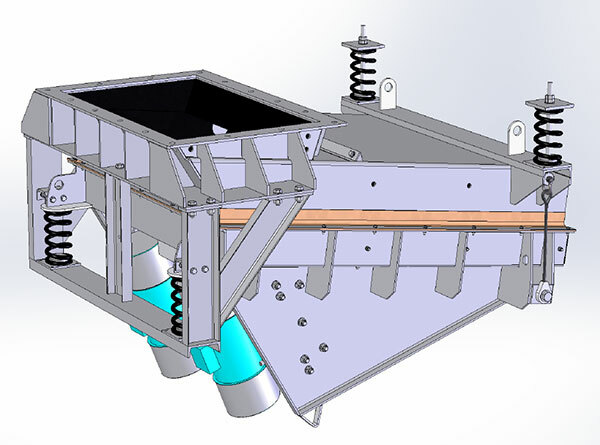 JVI Vibrating Feeders are based on single-mass drive technology. This rugged, single-mass design eliminates maintenance and tuning requirements typical of two-mass systems. All JVI equipment is custom engineered to meet your specific application’s requirement – light, medium, and heavy duty applications. Our innovative static chutework package combines the chutework and support system. This unique arrangement allows for easy and compact installation. JVI Vibrating Feeders deliver high capacity, repeatable performance and trouble free service. *Machine capacity dependent on material bulk density. For immediate assistance with technical information and specifications, please call us at (832) 467-3720 or send us an e-mail at sales@jvivibratoryequipment.com.